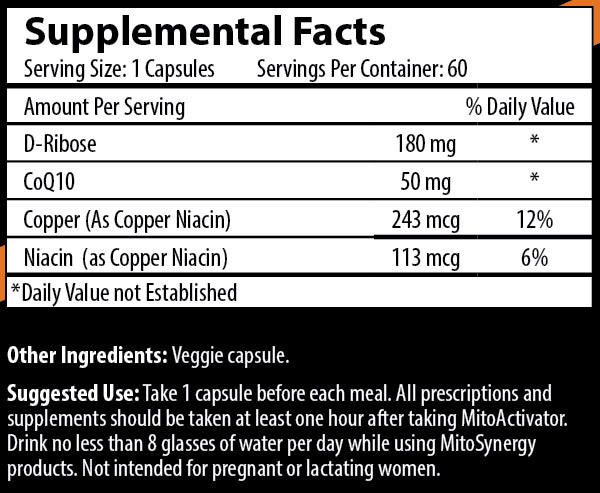 Introducing the World's First Patented Bio-Available Copper1 Supplement. Whether you’re healthy and simply need more energy or suffer from chronic pain and fatigue, MitoSynergy can help you improve the quality of your life and help you take control of your discomfort and pain. 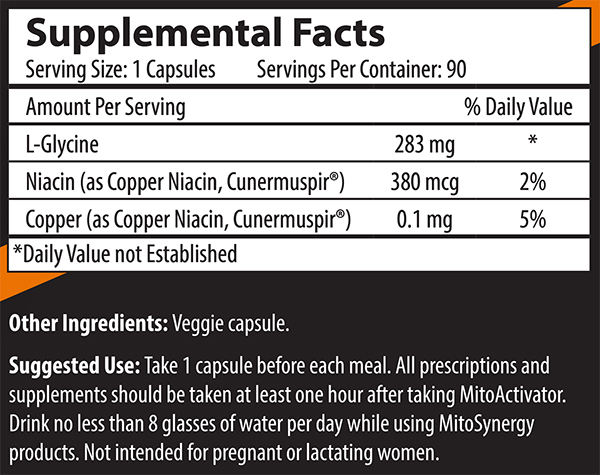 With a one of a kind blend containing the patented Cunermuspir Complex, MitoSynergy can dramatically increase your energy and help to relieve your pain and discomfort. Check out this amazing censored video showing how our patented bioavailable Copper1 helps eliminate harmful bacteria from your body plus boosts your immune system. Ensures Proper Growth. Copper is essential for normal growth and health. Thus, it is very important to include this mineral in balanced levels in your regular diet. It is also beneficial for the protection of the skeletal, nervous and cardiovascular systems. Copper deficiencies are seen in many third world countries and are reflected in a number of birth and growth defects in children of those nations. Prevents Premature Aging. Copper is a strong antioxidant, which works in the presence of the antioxidant enzyme superoxide dismutase to safeguard the cell membranes from free radicals. Superoxide dismutase is one of the strongest antioxidants that work within the body in the fight against free radicals. Free radicals attack different organ systems but are specifically studied in terms of their effect on aging, including wrinkles, age spots, susceptibility to various types of cancer, macular degeneration, and kidney malfunctions. Having enough copper in your daily diet can keep you looking younger for longer! Treats and Helps to Kill Lyme Disease Spirochetes. 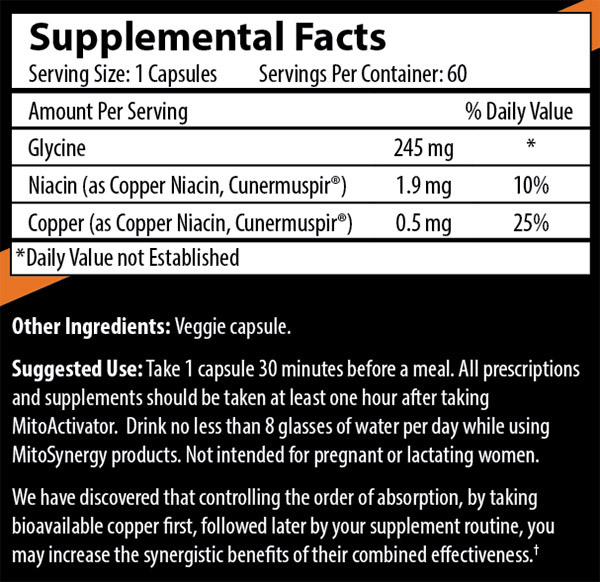 Copper 1 is unlike all the other coppers you see in most of the vitamins and supplements on the market today. Copper 1 helps to kill Spirochetes that is one of the leading causes of Lyme disease. When taking Copper 1, it is advisable to drink at least 8 glasses of water per day to help flush the dead and dying spirochetes from your liver. Regulates Melanin Production. Copper is a vital component of the natural dark pigment, melanin, which gives coloration to the skin, hair and eyes. Melanin can be produced by melanocytes only in the presence of the cuproenzyme called tyrosinase, which is derived from it. Intake of its supplements also helps in protecting against the graying of hair, so while it is often overlooked as an antioxidant mineral, it does protect the integrity of those cells and helps to keep you looking younger! It also maintains the color of your eyes, and is essential, along with zinc, to keep your eyes beautifully colored into your old age. Increases Energy Production. Copper is essential for the synthesis of adenosine triphosphate, which is a place in the body where energy is stored until needed. When we have enough of this element in our bodies, we will have enough functional and accessible energy to get through the day without feeling lethargic or tired. We offer a 30 Day 100% Money Guarantee if you are not completely satisfied with any MitoSynergy purchase from our website. Refunds will be given on one open bottle only in addition to any unopened bottles. Refunds will not be given on multiple open bottles.